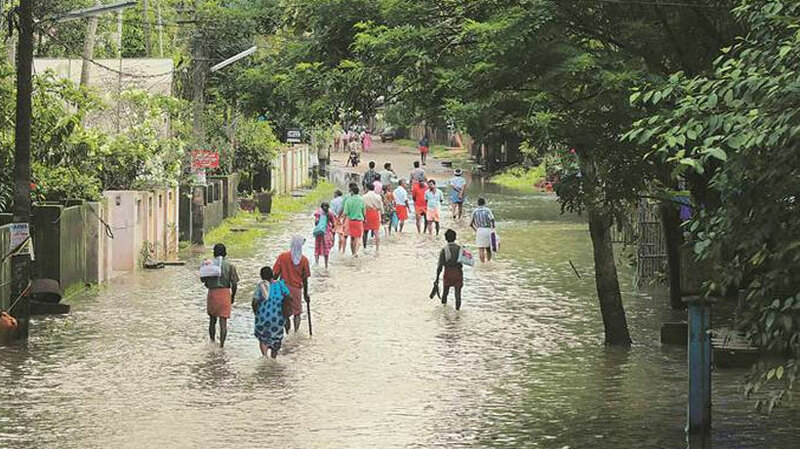 Kottayam: Onam celebrations were largely dull as the devastating floods traumatized people across the state. Though the advent of the month of Chingam put a sudden brake on the calamities caused in the dark month of Karkidakam, people have not recovered from the shock they had suffered during the last few days. Over 250 people died in the calamity. All the fury of nature abated on the first day of Chingam leaving behind a trail of tragedies opening the gates to welcome the harvest festival of Onam. The government agencies, voluntary organisations chipped in with a variety of programmes to boost the sagging morale of the survivors in the relief camps. Actor Mammootty visited a relief camp and exhorted the people to forget the past and make a new beginning. Playback singer K S Chitra visited a camp and rendered songs to cheer up the people. Ministers, politicians including Thomas Issac, G Sudhakaran, V S Sunil Kumar, V D Satheeshan, T N Prathan, Vellappally Natesan and others joined hands in organising various entertainment programmes and a sumptuous feast. Various outfits planned in advance and brought delicacies made by them making the event colourful. Flower mats were laid in all the camps and women organised various dance programmes. The government has cancelled all celebrations in connection with the festival. Onam is celebrated to revive the days of the golden rule of King Mahabali when his people were very happy and prosperous and there was no misery anywhere. It is believed that Mahabali visits every household during the first ten day beginning from Atham day. The festival brought havoc to business community from corporate houses to roadside vendors. Even Asia’s largest shopping mall Lullu was shut down as water entered its basement. This is tip of an iceberg of the losses caused by the flood to the business community, said a trader. Laxmi of Tamil Nadu , a flower vendor, who used to earn a good deal during Onam, is all upset as the profit was very disappointing.